I just got back from a five-day trip to Portland (love it up there) spending time with family, but I am so behind on my Thanksgiving series that I plan to post a recipe everyday for the next 15 days straight! Last week before I left I made a Roasted Grape Salad with Shaved Fennel, Apple, Candied Walnuts with a Tarragon Vinaigrette and it was so delicious that I plan to serve it as my first course for Thanksgiving dinner. This is a very elegant salad and all the ingredients remind me of California, especially the grapes, the fennel and the wine. Just perfect for a fall dinner or anytime you want to impress your guests. Add wine and agave to a small sauce pan and cook on medium heat for about 30 minutes until you have a thick syrup that coats the back of a spoon. Remove from heat and set aside, the syrup will thicken more as it cools. You want about 1/3 cup reduction when finished. Mix all ingredients together (except olive oil) in a small bow and whisk in olive oil slowly until emulsified. I prefer my vinaigrette to be more acidic a 2:1 ratio of oil to vinegar. If too tart, add in more olive oil to taste. In a small sauce pan bring 3 cups of water to a boil, add walnuts and blanch for 3 minutes. Drain walnuts and toss with powdered sugar, salt and cayenne pepper and stir until nuts are completely coated. Cover a sheet pan with a silpat or parchment paper and spread walnuts evenly on the surface. Bake for about 10 minutes until walnuts are caramelized, stirring frequently so that they cook evenly. Toss grapes with olive oil, salt and pepper and roast for about 20-30 minutes until soft and caramelized. Remove from oven and set aside to cool before using. Place butter/bib lettuce, apple and fennel in a large bowl, season with salt and pepper to taste and drizzle lightly with tarragon vinaigrette and toss to coat. 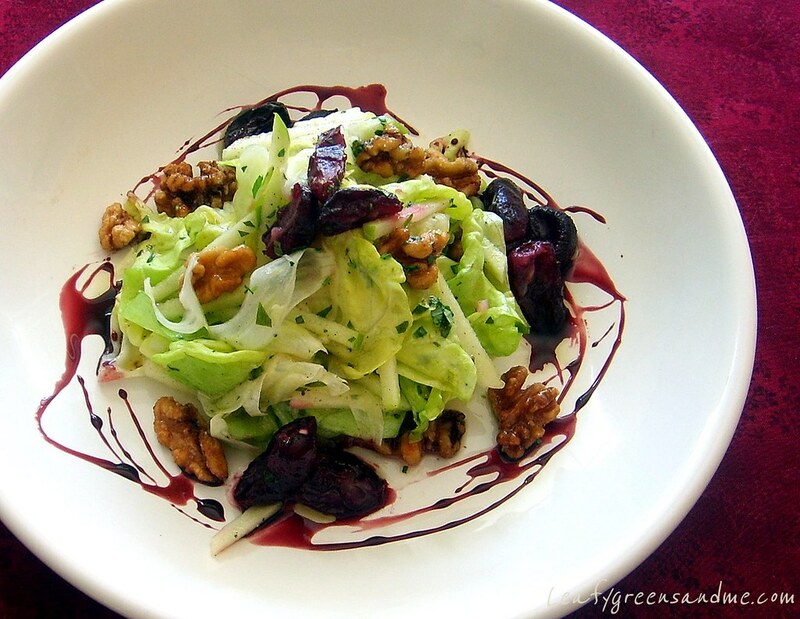 Plate salad and garnish with roasted grapes, candied walnuts and drizzle with red wine reduction.